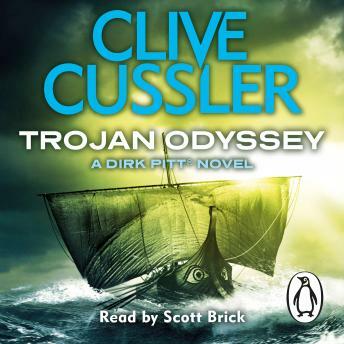 Penguin presents the unabridged, downloadable audiobook edition of Clive Cussler's dark adventure, Trojan Odyssey, part of the thrilling Dirk Pitt series. Read by the award-winning narrator Scott Brick. When a hurricane unexpectedly blows up off the coast of Nicaragua, a giant floating hotel lies in its path. With no escape for the helpless passengers and crew, it's left to Dirk Pitt and NUMA to launch a rescue and save the day. But in the storm's wake. Pitt and his team discover clues that point to an ancient mystery, with shocking implications for today. With heart-racing action and nerve-shredding tension, Trojan Odyssey proves that Clive Cussler is a master storyteller. Trojan Odyssey is the seventeenth of the bestselling Dirk Pitt novels - the series that also includes Atlantis Found and, his first novel, Mayday - and hero Dirk Pitt finds himself on the frontline of a battle against not only the elements, but also international conspiracy.